Last Saturday, we went to the Getty Museum in Los Angeles to see their exhibit “Power and Pathos: Bronze Sculpture of the Hellenistic World,” featuring bronze sculptures on loan from multiple museums. One in particular keeps my attention: Medallion with Athena and Medusa, circa 200-150 B.C., a bronze that once stared prominently from a chariot. Athena is the goddess of both war and wisdom, and here she is armored and cocking her right arm as if to bring down a spear on some unfortunate skull. As further protection, she has a facemask made from the visage of Medusa, the Gorgon with the power to petrify, to turn flesh to stone. 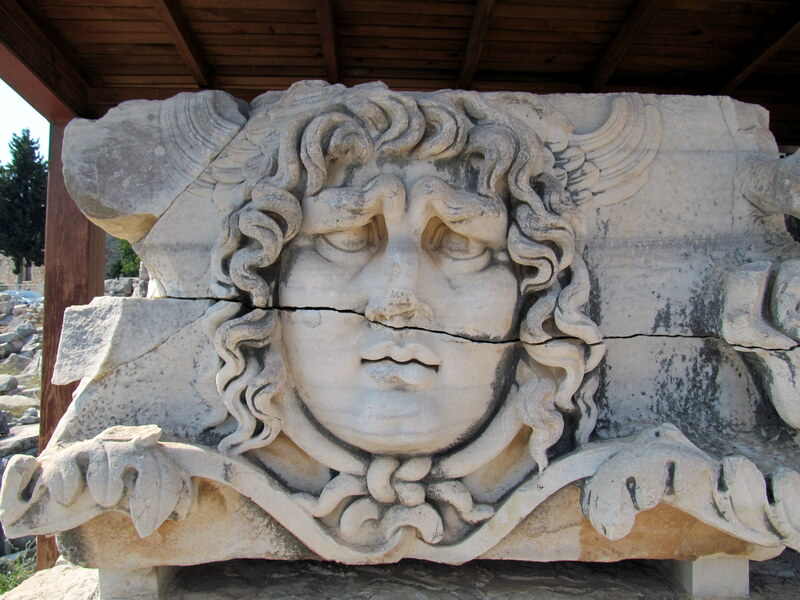 Here’s another image of Medusa, this one from the Apollo Temple in the modern Turkish city Didim. The medusa here functions in much the same way as Athena’s mask: to ward off evil and bad luck. What is interesting about the idea of Medusa’s face as Athena’s mask is that it implies the obverse of wisdom is a visceral kind of horror, one that calcifies, that ossifies. In his exploration of archetypes, Carl Jung classifies each positive archetype as having a Shadow Self, a version in which the “negative” possibilities overwhelm the “positive,” the labels of negative and positive themselves being subjective and dependent on context. In this way, a Father archetype could be encouraging, guiding, and embodying responsibility, or it could become a devouring figure like Saturn, destroying his children out of his own insecurity. This medallion depicts the Athena’s Shadow Self; rather than embodying a rational, critically-thinking intelligence, she has become a grotesque, serpent-haired embodiment of the power of nightmare and the perverse. What makes Medusa so frightening? She embodies what Mircea Eliade –the great Romanian thinker– refers to in his work The Myth of the Eternal Return as indeterminate unity, a symbol of chaos wherein objects or beings that are meant to be separate –such as a woman and a snake–combine into one monstrous figure (see also the minotaur, werewolf, etc). In much of myth and religious narrative, these figures of chaos must be vanquished by some hero, some embodiment of rational hierarchy. She has snakes for hair! Snakes for hair! The snake is a powerful symbol of both death (the poisonous serpent) and healing (the caduceus and Rod of Asclepius). Because they hibernate over winter and emerge from the ground in the spring, snakes have been a traditional symbol of supernatural power; they access what lies beyond. She embodies the power of seeing and being seen, a tension or anxiety all too prevalent today as well. To see Medusa to be seen by Medusa, which results in that stare becoming frozen; the viewer is unable to look away. The Gaze features prominently in modern analysis of gender and ethnic conflict; Medusa personifies this possibility of being defined by the gaze of the Other, which traps Medusa just as much as it traps her victims, for she cannot be seen without the other person recoiling for eternity. Medusa herself never dies. After she is beheaded (by Perseus), she becomes mounted on Athena’s shield, her power to see (and thus petrify) intact. She becomes, in effect, weaponized. Utilized in architecture throughout the Mediterranean, these Medusa faces become symbols called Gorgoneion used to ward off evil and misfortune. Thousands of years later, these faces still have the power to still the viewer . . . if only to take a photograph.